Reduced to clear! (normally $45) The Koolance SEN-LK001 offers leak detection for very small amounts of water. Housed in a 3.5in drive bay profile, the electronic circuit can monitor up to three separate leak sensing cables. One 46cm (18in) long sensing cable is included, which can be increased. Powered by 12VDC from a computer power supply connection. The sensing cable is attached to the detector using the provided 53cm (21in) connecting wire. 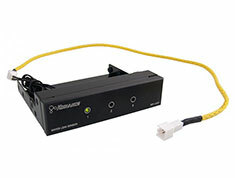 Additional yellow sensing cables can be combined for longer lengths. Extra sensing cables and connection wires are available here.